Stormwater is one of the top ways pollutants like excessive nutrients, toxins, and pathogens get into Grand Traverse Bay. In fact, two locations on East Grand Traverse Bay are on the state impaired waters list due to excessive amounts of pathogens, most likely caused by heavy stormwater inputs during rain events. As citizens, we all need to invest in ways to keep the Bay clean and beautiful. As part of a pilot educational stormwater campaign project for Traverse City residents in the East Grand Traverse Bay neighborhood area, TWC conducted individual property assessments to determine what types of improvements could be made onsite to reduce possible negative effects from stormwater runoff. These improvements are simple ones that homeowners could implement themselves (i.e., rain gutter placement, installing rain gardens, fertilizing/mowing practices, etc.). We followed up these visits with written recommendations to the homeowners and a variety of information to assist them with any improvement they may wish to make. A big THANKS goes to: Etta Rajvovich, Marion Chase, Tom Scott, Mary Jean Brick, Allen Scott, Lola and Chester Zaremba, Eunice Lampkin, Carole Chirgwin, Nancy Stehouwer, Joe and Mary Savoldi, Carol Thompson, and Joanne Walters for participating in the assessments. They are part of our community’s solution to stormwater pollution! Many people are not aware of where water goes after it flows into a catch basin at the side of a road. In our area, the short answer is – into a river, lake, stream, and eventually Grand Traverse Bay. 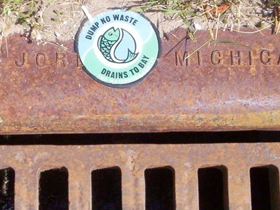 To help build awareness of this fact, TWC staff, in conjunction with the City of Traverse City, marked stormdrains in neighborhoods in the vicinity of East Grand Traverse Bay and 8th Street. These markers were affixed directly above the curb cutouts and read “Dump No Waste, Drains to Bay.” Be on the lookout for them and let us know what you think!